Under the direction of famed chef José Andrés, Jaleo offers an impressive assortment of tapas, the traditional small dishes of Spain, as well as savory paellas, superb sangrias and a fine selection of Spanish wines and Sherries in a festive, casual atmosphere. 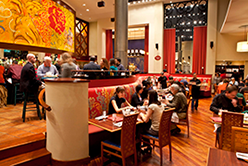 Created in 1993 by Rob Wilder, Roberto Alvarez, and José Andrés, Jaleo has become a DC institution. Jaleo is a Spanish word meaning revelry, fun, and bustle. Jaleo’s striking design blends this festive spirit with the unique personality and style of chef José Andrés. Led by the exciting vision of Andrés’ friend, Spanish designer and architect Juli Capella, Jaleo’s look is “a relaxed environment of bold colors, with a hint of madness and irony, and a touch of Mediterranean surrealism,” explains Capella. Jaleo features sleek furnishings and artwork created in Spain by some of the country’s best contemporary designers.